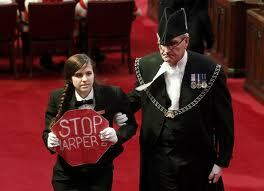 On June 3, 2011, a young woman named Brigette De Pape walked onto the floor of the Senate in Ottawa, where she worked as a parliamentary page, and held up a handmade stop sign that read “Stop Harper,” referring to Prime Minister Stephen Harper of the Conservative Party of Canada. Her defiant act gained instant national attention, making the attractive and well-spoken De Pape a cause célèbre. She was even (jokingly) offered a job by Michael Moore after being promptly fired from the Senate. On July 1, 2012, as part of Canada Day celebrations, 12 cities across the country held “National Stop Harper Day” events. 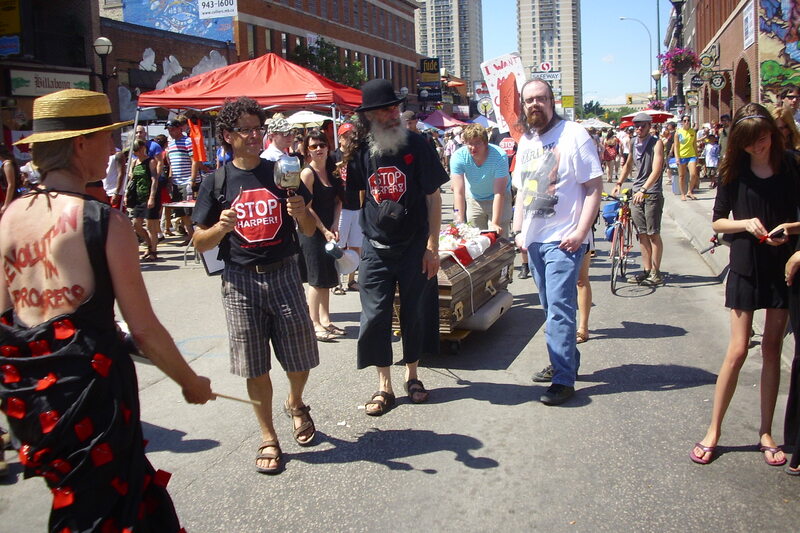 In Winnipeg, some two-dozen participants held a “Funeral for Canada,” walking solemnly through the bustling Osbourne Village street festival while pulling a coffin that was meant to symbolize the death of the country in light of the Harper government’s many cutbacks to social programs, environmental regulations, and their dramatic increases in military spending. 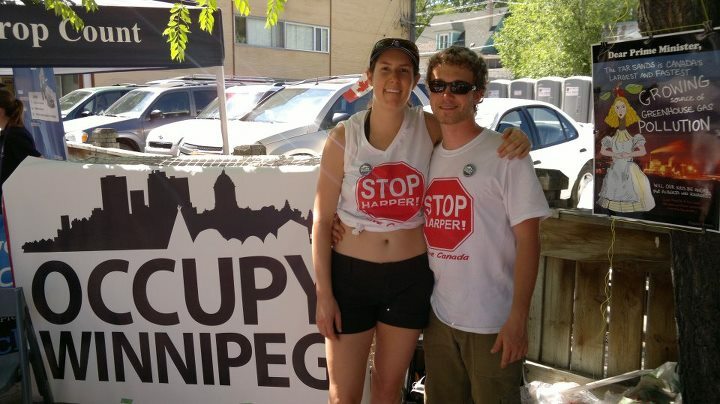 Several of the participants were wearing Stop Harper T-shirts, which they had bought at the festival from Occupy Winnipeg, the local manifestation of the Occupy movement. Earlier in the day, a Hercules bomber flew several times over the city’s downtown core and throughout the country a government ad was circulated celebrating Canada’s “victory” over the US in the War of 1812. On Twitter, #DenounceHarper was trending second only to #HappyCanadaDay, adding further weight to these opposing visions of the nationalist imaginary. These brief, somewhat stylized snippets, are presented here in order to provide some background detail for a basic point about authority and representation, which has become all the more apparent to me since I began to do field research as a participant-observer at Occupy Winnipeg, beginning on October 15, 2011. After being forcibly evicted from Memorial Park on December 21, 2011, and having only re-occupied public space on one occasion since this time, Occupy Winnipeg continues to function in a type of residual phase (to borrow from Raymond Williams’ typology of social structures, moving from emergent to dominant to residual in multiple variations) in relation to other social groups that are loosely connected by their general distaste for neo-liberal economic policies on both the national and international scene. Within Canada, the most common symbols of this sentiment can be seen (above) in the form of the Stop Harper logo, the small red square, typically pinned to one’s clothing, and the banging on pots and pans, both of which are synonymous with the Quebec student protests, the largest such protest to date in North American history. Despite the current absence of a physical occupation in Winnipeg—an arguably “essential” characteristic of this group—and despite the use of symbols that would not be easily recognized by many Occupy groups outside of Canada, the Stop Harper Campaign suggests a continuity of this movement in the absence of any core doctrines or organizational structure. Needless to say, these links are tenuous and not formalized by participants. Tracing the development of this movement from its inception I have been able to see first hand how a social formation has evolved and adapted to local conditions, given such factors as the political opportunity structure (i.e., Canada did not experience a housing crisis or near near bank collapse), the range of participants and the opportunities available to them, and the interests of those who are involved in shaping its direction. Indeed, it was initially my idea to have the Stop Harper T-shirts made. In the absence of things like a founding document/text or a recognizable institutional hierarchy that is able to enforce certain rules and behaviors and thus make claims to authority, it is easy to see the Occupy Movement as a contested, malleable, and evolving phenomena and not some timeless essence, despite caricatures to the contrary or, as might be interpreted from the image below, claims to the continuation of some purified ideal. This entry was posted in Matt Sheedy, Theory and Method, Uncategorized and tagged authority, Funeral for Canada, Nationalism, Occupy Movement, ritual, social formations, Stop Harper, symbols. Bookmark the permalink. Interesting post. I agree that social formations are “contested, malleable and evolving phenomena and not some timeless essence”. The next question, for me, is to interrogate the interests served when scholars and members of these social formations separate out a particular formation, or type of formation, as having a different quality, whether timeless, sacred, and unchanging or uniquely important, grassroots, or pure/without political motivations. Are you asking how such formations selectively choose to emphasize certain aspects of a movement and then (perhaps) imbue it with sacredness? If I’m reading you correctly, then there is certainly a lot of this going on in the movement, from the sacralizing of rituals to what I’d call a search for origin myths, linking current narratives in an unbroken chain to things like the Haymarket Riots in Chicago, the Arab Spring, etc., or figures like Gandhi, MLK Jr. or Jesus. Since these formations tend to emphasize a horizontal decision-making structure, however, their sentiments don’t tend to have any “official” or authoritative status, so far as I can tell. 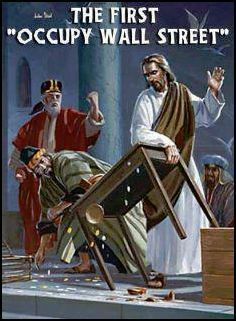 It’s more piecemeal without much attempt to police orthodoxy. As for for political motivations, I think these are inherent in everything we do and so it’s best to be upfront about them and invite criticism with this in mind. As your original post suggests, we see these political interests and the effort to imbue certain things with sacredness in movements like the Occupy Winnipeg movement, while many tend to overlook the same process in institutions more commonly identified as religious. In fact, that separation between “religious” and political or economic movements itself is part of the sacralizing to promote different interests. Agreed. And it’s interesting that so few people make this connection, which goes to show, among other things, how perceptions of religion are so hard and fast in many ways. With the exception of an explicit relation to the supernatural or to some already established tradition, the themes of myth, ritual, symbol and soteriology are as clear as day. What interests me above all else, and why I think that the movement is important for religious studies, is that it’s a ripe example for comparison growing before our very eyes, where myths are being taken-up, enacted, connected with other myths and symbols, etc., and where variations emerge–be it in Winnipeg or Oakland–in relation to the interests of particular places. How or why religious formations are different/similar is an important question, and this tells us something, I think, about how we “imagine” religion.